"41AN26 - 17" by Timothy K. Perttula and Robert Z. Selden Jr.
DECORATION (INCLUDING MOTIF AND ELEMENTS WHEN APPARENT): The rim panel is defined by single upper and low horizontal engraved lines with upwards- and downwards-pointing excised tick marks. The rim panel is divided by four open brackets. 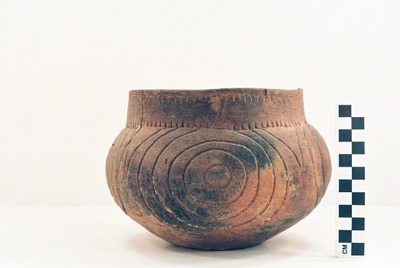 The vessel body has four sets of engraved concentric circles. The concentric circles are divided at their upper end by large open pendant triangles with their apexes pointing towards the vessel base. Poynor Engraved, var. Freeman globular bowl from the Richard Patton site.